I know I keep saying it, but I really can't wait for spring! I have prematurely started wearing my open toed shoes & dresses already! Lucky for me, we've had some days that truly felt like spring last weekend & this week, but according to the weather, it's supposed to get cold again, so who knows how long this weather will last. Thinking optimistically that the weather will stay warm , I'm sharing a few transitional winter to spring weather must haves today. Read on to find out what they are! 1. Light Weight Jacket. Once the weather is warm enough, one of the first things to be stored away are my winter coats. Instead I opt for a leather jacket, denim jacket or trench coat. These jacket styles will still keep you warm but are much more warm weather friendly. 2. Light Weight Sweaters. Because it is still February/March, putting away your sweaters for good probably isn't in the cards just yet, but you can start wearing your lightweight sweaters more often. Also, opt for sweaters that come in spring shades like yellow, blush or blue. 5. New Shoes/Bags! If there's one thing you can start switching out immediately, it's your shoes & bags! Start wearing some colorful accessories to welcome spring in. Even jewelry & sunglasses can be updated for spring & you don't have to wait to do this! I have been loving wearing these Vince Camuto booties since I got them. The black bootie style doesn't scream warm weather but the cutouts & peep toe make them perfect for the transitional weather. 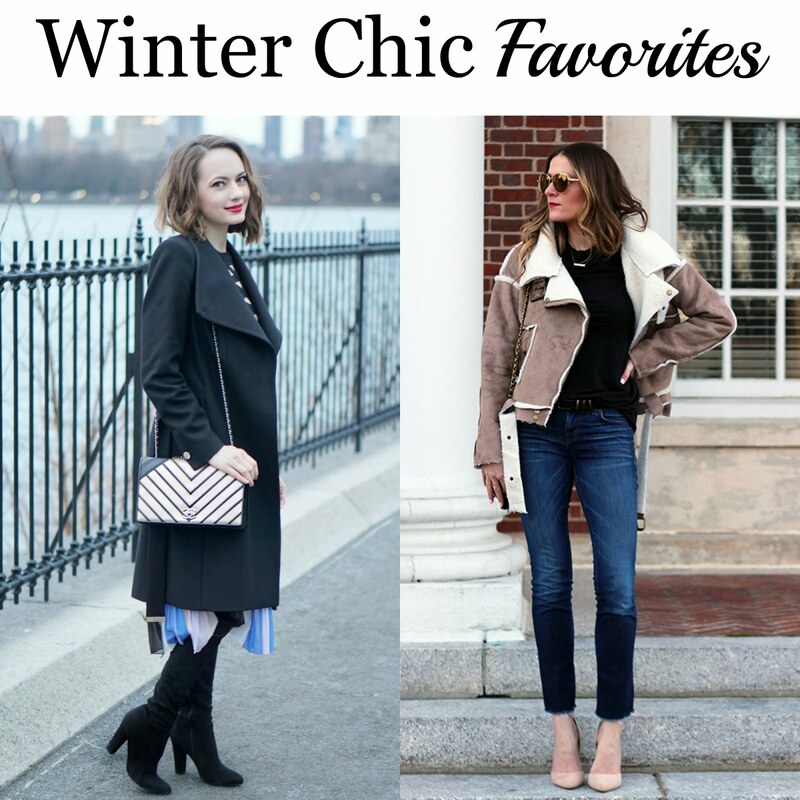 Last week we loved Katya from Style Sprinter & Rachel from Thread's for Thomas's chic winter looks! I like the idea of getting new shoes to make me excited for spring (of course, I do---I'm a shoe girl, ha ha)! The denim jacket really adds the classic touch to any dress! You look fabulous, Michelle! Me too - I love a new pair of shoes! Just got this pair of peep toe booties & a pair of mules! I'm sitting here waiting for it to stop raining to take photos! Last week storm Doris and now rain! Ugh - the weather can be a blogger's worst enemy! I know the feeling! This is such a perfect transitional outfit! I love the striped midi dress and stripes and denim are always fabulous together! I agree - a classic combo! Perfect transitional pieces! Bring on spring!! How gorgeous is this dress? I am also wearing stripes on the blog right now! I love that adding colorful accessories can really make an outfit feel more spring-like! You look fabulous! So many great pieces! Love the bag. This is just too cute! Love the dress with the belt and denim jacket! Great booties and bag too! You have beautifully transformed yourself into early Spring. Great tips and ideas and I am with you 100%. Open-toe booties, a bright tote, a striped dress with sleeves, a trench-coat, white sneakers and denim jackets are must have Spring items for me. Thanks for the tip on those awesome Vince Camuto booties. Love this look!! Such a great dress! I love this stripe dress on you, and how you styled it with the denim jacket! Also such great transitional tips. Thank you for the feature! Obsessed with that jacket from last week! Love this list of transitional items! Beautiful look, you can never go wrong with stripes! A denim jacket is a must-have!! Looking so fabulous in stripes and absolutely love those booties! Your shoes are so pretty, Michelle!!! I love them! But be careful when you order, I found them to run really big! Perfect transitional outfit! Love the bag. Totally agree on denim. 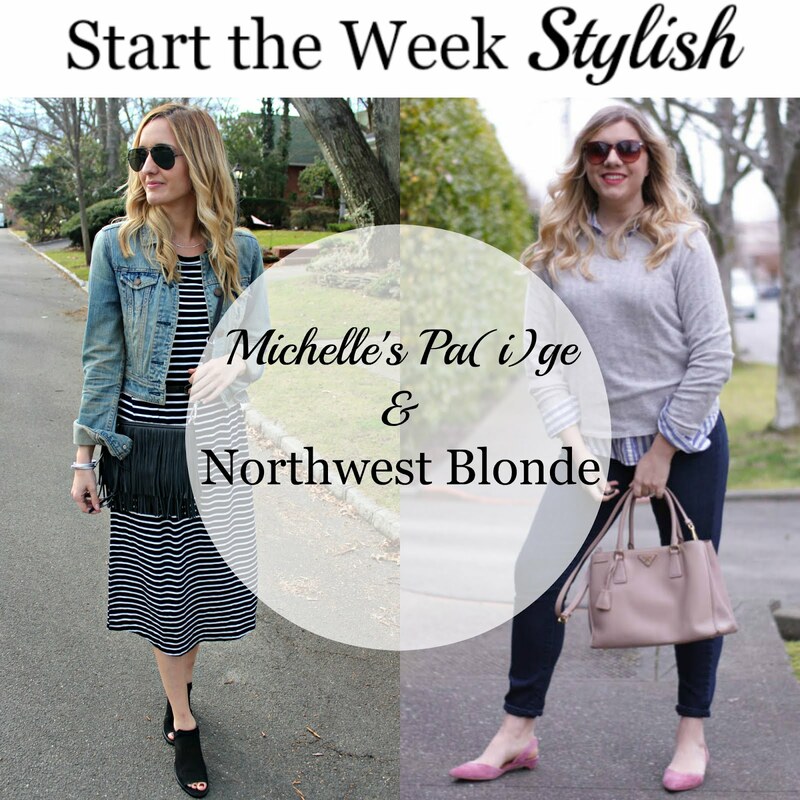 I couldn't agree move with your winter to spring must haves! I love the striped and denim together and I adore that bag! Such gress is a really must have! I'm anxiously awaiting spring too! These are perfect transitional pieces! That dress is darling! Me too - I can't wait to start wearing more of these warm weather pieces! These booties are perfect for spring - and they look comfy too! They are super comfy! They come in a great neutral beige also! Love this look! Stripes are such a classic and I love it paired with the denim jacket! This is a great look for those warmer days! Great pieces for transitional weather. I always like layering myself when weather goes all haywire. Yes - the more layers the better during this weather! So cool navy style with a denim! I like your style dear! This is such a perfect transitional outfit. I love the easy going vibe of this dress, and it looks so amazing with your denim jacket. Perfect inspiration! This is a perfect look to go from winter to spring! I am loving your midi skirt! Even better - it's a striped dress! Beautiful look! Love your dress! A striped dress and denim jacket is the perfect transitional outfit. I love the booties, especially the deep V at the sides. Bang on suggestions here. I love the idea of investing in a spring colored bag because around these parts we are still t least a few weeks from lighter jackets, open toes and springy dresses. Love this little look features today and hopefully by the end of the month I can copy it.